With this release we are excited to unveil new enhancements to our checklist functionality we introduced in the last release. Admins can now create templates for checklists and then users can apply them to tasks in the Agency Workspace. This great new addition to checklists provides better management of your agency’s tasks. We also added a few additional enhancements to our department tasks functionality, as well as enhancements for tasks in EZLynx mobile. Before we begin, it is important to note the new checklist functionality for tasks is associated to the EZLynx Enhanced Workspace. If your agency does not have access to the Enhanced Workspace, please contact [email protected] to request this time saving feature for your agency. Enhanced Workspace allows you to associate tasks to departments (groups of users), mark tasks as important (giving them better visibility in your tasks list), set a time when your tasks are due, and now you can add checklists to tasks. There is a new area in EZLynx where an admin can manage the agency’s checklist templates. Please note: If your agency does not have Enhanced Workspace, the Checklist Management tab will not be available. There are a few important things to note on this page. Use the search field to locate the templates by their titles. Notice the checkbox to show disabled templates. You can also see which user in your agency created a specific template, the date it was created, and the status of each template. Checklist Templates can either be ENABLED or DISABLED. Once enabled, Checklists can be added to tasks by any user in your agency. If disabled, a checklist will not be available for task assignment. One reason an agent may decide to leave a template in a disabled status is if he or she is in the process of editing the template. Another reason might be if you have not fully fleshed-out all the items you would like in the template. These are just a few reasons why you might want to disable a template. Before we move on to creating checklist templates, it is important to note key functionality for agencies setup in EZLynx with branches. If you are positioned at the main office, you can share the checklist templates you create with your entire organization. This means your sub-branches can all see the same templates as you. This allows for better consolidation and streamlining of processes. If you are in a sub-branch and you have permission to this page, the Created By column will show the Main Office name instead of the specific user’s name, if the template was shared by the main office. It’s easy for an admin to create a new checklist template. Hover over the EZLynx Settings icon and click Activity Settings. Navigate to the Checklist Management tab and click the green New Checklist button in the top right corner. You’ll land on the New Checklist Template page. Enter all desired items, including a Checklist Title. EZTip: Make your title descriptive enough for users to understand what it is for later. For example, if the checklist is for adding new commercial auto accounts and it is applicable to accounts over a certain dollar value, then make that distinction in the title. This helps your agency’s users easily identify the checklist’s purpose later when they are adding a task. Notice there are a few other options available to select when creating a template. For agencies set up with branches in EZLynx, the option to Share this Checklist appears. Mark this box to share this checklist with all your organization’s branches. For agencies without branches in EZLynx, this option is not available. Once the checklist template is ready for use, check Enable this Checklist to allow all users in your agency – and branches, if shared – to be able to select the checklist template when adding a task. Similar to the one-off checklist that went out in our last release, you can add up to 10 actionable items to a checklist template. Admins can edit a checklist template from the Activity Settings page. Navigate to the Checklist Management tab and locate the template to be updated. EZTip: Use the Search field to locate by the checklist title, or simply adjust the page size to see up to 100 templates on the same page. Edit – this opens the create template page and allows you to adjust your template settings. Enable/Disable – depending on the template’s status you can either enable or disable it. Copy – allows you to copy a template to make similar templates quickly. Delete – allows you to delete a template. Please note this cannot be undone. Some of you are already familiar with how to add a one-off checklist to a task – a feature from our last release. With this release, we have updated the functionality in the Add Checklist area for tasks. Please Note: The checklist template selector only appears if an admin in your agency has created at least one checklist template from the Activity Settings page. Here you can select from the currently enabled checklist templates for your agency, or you can create a one-off checklist by clicking Create Checklist. After you select the template from the drop down, we show you the items that make up the selected checklist. If you chose the wrong one, then simply open the drop down again and select the correct checklist template. Please Note: you can edit a one-off checklist you have applied to tasks; however, we do not allow you to edit Checklist Templates once applied to a task. This helps maintain the integrity of the templates your admins create. This means that if you are unable to complete a checklist item, then you need to check it off as done and make a note about why you could not complete it, in order to close the task. For agencies with EZLynx Automation Center, our new Checklist Template functionality is a welcome addition to Workflows. If your agency has Enhanced Workspace and an admin has created Checklist Templates for your agency, then when you add or edit the task in a Workflow, you have the option to Add Checklist. This allows you to apply a checklist template to an automated workflow. Please Note: we do not permit the creation of one-off checklists in Automation Center. Rather, you can take advantage of your agency’s checklist templates. With this release we have added two new enhancements to the Department Task functionality. We now display an automatic task reassignment message when a user attempts to edit a department’s task. We have also made departments available for tasks when creating Automation Center Workflows. When you edit one of your department tasks, you’ll notice the system now attempts to automatically reassign the task to you. This enhancement prevents you from needing to transfer the task’s ownership from the department to you. Notice the message indicating that this department team task was automatically reassigned to you. Click the blue Undo link if you don’t want the task automatically reassigned to you. This reverts the task assignment back to the department. Simply toggle the task assignment to Specific Users. This allows you to select the department you want to assign the task when its automated event is triggered in EZLynx. When you select the departments, remember you choose each branch’s respective department. You also need to select the corresponding branches you want the workflow to apply to. For the Task action select Specific User as the assignee. In the drop down, select the Personal Lines Support department for Branches A and B. On the final step of the workflow creation, apply the workflow to Branches A and B. Doing this ensures that the workflows execute correctly in the system and you do not experience any errors. With this round of workspace enhancements, we have also updated EZLynx mobile to support Checklists and Department Team Tasks. This helps provide you a more encompassing experience when working in EZLynx. We also updated the task list in EZLynx mobile to provide additional filters. We hope you enjoy these new enhancements. At EZLynx, we strive to enhance our product to make your life easier. We have a lot a great new functionality on the horizon for the Agency Workspace, so stay tuned for that! We are excited to announce our new Text Messaging pane for the Agency Workspace. If you have ever used EZLynx Text Messaging, you might have asked yourself, “How do I see the conversation associated to the number I’m texting?” With this release, we transitioned the texting process away from the pop-up screen and moved it to the workspace. This new enhancement allows you to see the full historical conversation with your customer. Plus, you can send texts to other phone numbers associated to the account! You can access the new Text Messaging pane for the Workspace by clicking on the text message icon in the Account’s sidebar. This will launch the new texting pane for the Workspace. The pane allows you to see the full conversation associated to the phone number on the account. In the next section, we will show you how to filter to other numbers, but for now it is important to note who is saying what in the conversation. The blue messages are from you and the grey colored messages are from the customer. For customer accounts with more than one phone number, you can select the desired number from the dropdown in the Workspace texting pane. Contacts saved to the applicant account will also appear in the dropdown. Please note that we do not filter the dropdown list to only show Mobile numbers. This is because some agencies enter mobile numbers in the Home phone number field. For this reason, we allow you to select any phone number and we indicate the phone number type (i.e. home, mobile, work, business). It’s easy to attach documents to a message in the new texting pane for the Workspace. In the bottom left corner of the pane you will notice an attachment/paper clip button. Please Note: If your agency does not have MMS for your EZLynx texting service, then you will need to upgrade your account for this feature. If you do not have the MMS option, then the paperclip button will be disabled. Click the button and you will land on the screen to select your attachments. Here, you will notice the same attachment functionality that is available today with texting. You can add documents from the account’s document library and you can upload documents from your computer. When uploading a document from your computer, we will automatically select the option to add the respective document to the account’s document library. This is a time-saving feature that you can choose to unselect if you would like. After adding your document/image, it appears below the message box. You can choose to remove the item if you would like, prior to sending. After sending the message, you can click on the image icon in the message pane to download and view the image. The same is true for viewing messages sent to you from the customer. We hope you enjoy this new enhancement. We are already hard at work on getting additional items added to the Text Message area of Communication Center to update its look and feel as well as functionality. At EZLynx we have been working on enhancing Commissions to make life easier for your agency. We made some helpful changes to commission rule creation and the Commission Rules page. You will see an additional filter field on the Commission Rules page called Payees. The rules will filter according to the payees selected in this field. You can add unlimited payees to this filter. Currently, when you copy a rule it doesn’t indicate that you are working with a copy of the rule. With this release, copied rules will now include “Copy of” at the beginning of the rule name, in order to make it clear that a rule is being copied. This name can be modified when creating the new rule. On the Commission Rules page, select Actions next and click Copy. This opens the commission rule creation workflow. EZTip: The final step of rule creation allows you to remove Copy of from the title, if desired. As you can see in the image below, our copied rule indicates that it is a copy with a new name. You can now see the description entered when a rule was created on the Commission Rules table. In the image below, New Rule for Bill has a description that was entered during the rule creation. Click the description icon in the table, and you can see the description without editing the rule. You now receive an error message if you create a rule that uses a transaction effective date outside of the policy effective date range. The system will not let you proceed with creating the rule if you do this. In the image below, the transaction effective date is outside of the policy effective date range, causing the error message to pop up and red warning boxes to appear around the date fields. Importing a commission statement with more than 500 line items for unique policy numbers will now automatically match all possible matches. You can now view additional details on commission statements. Add new columns to the statement using the Statement Details Column Editor. Currently, you can only see columns for Applicant, Policy #, LOB, Trans Type, Match Status, Premium, and Commission. With this enhancement, you can add the following columns to a statement: Transaction Effective Date, Effective Date, Expiration Date, Agency Code, Producer Code, and Producer Code Override. Go to a commission statement that has line items. Move columns from Hidden to Visible, and vice versa. In addition, you can change the display order of the columns. Then, click Save. You will now see the columns that you selected in the column editor populate in the Commissions / Rules table. We hope you enjoy these new enhancements. At EZLynx, we strive to enhance our product to make your life easier. Click HERE if you are interested in applying to join our commissions beta! We have added five additional lines of business to the full policy summary view support in Client Center. When a policy is issued for the state of New York, the insured will see an updated Client Center message to contact the agent for an ID card. This is to help agents maintain compliance with all state laws. We updated the policy screen in Client Center to be consistent with the summary screens displayed in EZLynx and added five additional LOBs with this release. This update allows you to provide additional policy information for your customers’ convenience and reference. 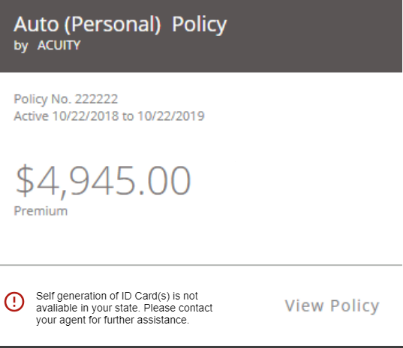 To manage the display of your customers’ policy information, an admin can navigate to the Client Center settings area. Hover over the EZLynx Settings icon and select Client Center. For agencies with multiple portals, select the desired one from the dropdown. Scroll down to the Display Options area and decide what your customers should see when they log into Client Center. EZTip: Uncheck View Policy Details if you want to hide the policy details from the insured in Client Center. Customers will still see basic policy information including the carrier, line of business, policy number, effective date and expiration date. The details such as coverage limits, locations, additional interests and more are hidden from view. We also updated Client Center messages policies issued for the state of New York (See Below). This update applies to all auto policies. This does not affect Certificate Self-Generation for commercial policies. EZLynx is proud to announce a new enhancement to Communication Center! Agents will now automatically receive an e-mail notification when a one-off email (not bulk email blasts) that you send out from EZLynx fails to be delivered due to a bounce or a spam complaint. Even though our system already records in the applicant’s activity log when an email bounces or is flagged as spam, if you are not actively checking the log then you might not realize an email failed to deliver unless the applicant contacts you directly. With Email Campaign Notification Options, the user that sent the email will by default automatically be notified as soon as the email failed. The feature can be found in EZLynx Preferences, under the Settings icon. Once there, navigate to the bottom and toggle the checkbox to turn the feature on and off. EZLynx alerts you by email you whenever any single email you send bounces or is marked as spam by the recipient. These notifications only apply to one-off emails that you send to individual applicants (i.e. non-marketing emails). The intention here is to notify you only when, for example, those important and time-sensitive policy documents that you sent failed to be delivered. We will address reporting enhancements to Marketing Emails in a future enhancement, which would include better visibility as to the deliverability of your marketing campaigns. Please Note: Equipment Breakdown will be replacing the Boiler and Machinery line of business to stay up to date with ACORD form standards. The new lines of business will be available to use within the policy creation screen.